So this has been kind of a crappy week. Bullying issues at hockey and at school. Or water heater broke on and flooded the basement on Tuesday. I had to run out and buy a new dryer on Friday. Michigan posted its latest ugly loss on Saturday. This morning, Ryan got up at 6 a.m., put on his Sharks jersey and went downstairs with Veronica to watch the Sharks-Devils game from late Saturday night on the DVR (without knowing the result — this is huge). And for the first time in a week, all was right in our world. I have so much to be thankful for, but I think that status sums it up quite nicely. Last week was not a banner week. 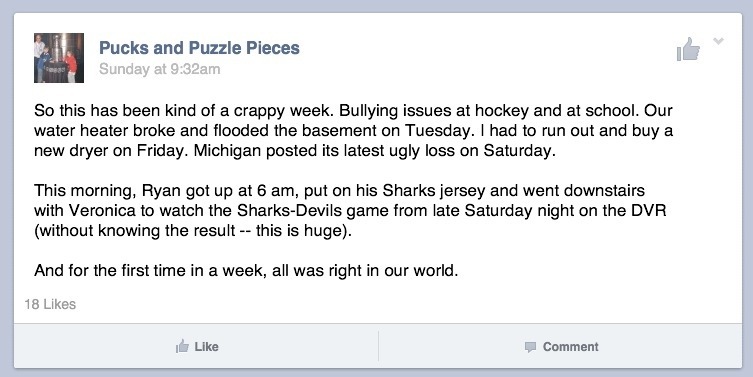 The previous week ended with concern about possible bullying on Ryan’s hockey team. This one started with a flooded basement, a new water heater, and a missed day of work. It ended with a call from Ryan’s school about another incident and a an unplanned trip to the appliance store to buy a dryer on Friday. I am thankful that our son has the words to tell us what’s going on. I am thankful for the guardian angels — hockey coaches past and present and all manner of teachers, aides and counselors, as well as some fellow students, that look out for Ryan. I am thankful that we have the means to replace two major appliances in a week. I am thankful for hockey, the engine that drives our family. For when everything went to crap last week, it was hockey that brought us back to our normal. It took convincing to get Ryan to agree to watch the Sharks-Devils game on DVR without knowing the score. To see the look on his face shone he burst into our room, Sharks jersey already on, at 6:00 a.m. Sunday morning was to see pure joy. I wish everyone could see the way Ryan watches a game, fully immersed in it, with exaggerated celebrations and moments of concern, and yet able to walk away from a negative result without letting it get to him. He doesn’t watch a game so much as he experiences it. I am thankful for my Kentucky-born, college basketball-bred wife, who willingly got out of bed at 6 a.m. that Sunday, put on a Devils jersey, and trudged downstairs to join her son on the couch to watch the game. By the time I rallied from bed, it was already the third period and Ryan sat, grinning ear-to-ear as he watched and celebrated the final minutes of a 2-1 Sharks win. Veronica wasn’t much of a hockey fan when I married her, but she sure is indoctrinated now. I am thankful for my Devils-loving daughter, who was a good sport about the loss and put up with Ryan’s verbal jabs all day. As loyal as she is to New Jersey, I think there was a small part of her that was happy for her brother. She knew he’d had a tough week and that the result of the game made him happy. I am thankful that we are going to spend this holiday weekend together with immediate and extended family. I am thankful there is another Sharks game for us to watch together. Happy Thanksgiving, everyone. I hope you are all as blessed as I am.